You made a decision by reading this article. Perhaps you clicked through an email. Saw a headline on social media. Or a colleague referred the article to you. However you got here, you said “yes” to a conversion action. Why did you take this action? And, more importantly, what can you learn about your choice — and the greater field of decision theory — to get more people to say “yes” to your marketing, business, or other conversion goals in life. Flint McGlaughlin, CEO and Managing Director, MECLABS Institute and I had this very conversation recently with Catharine Hays, Executive Director of The Wharton Future of Advertising Program on Marketing Matters, a show she co-hosts on the Business Radio channel on Sirius XM powered by the Wharton School. We also discussed customer-first marketing research, humanizing the use of data, and the value proposition. Catharine Hays: You’re listening to Marketing Matters on Business Radio, powered by the Wharton School. Welcome back. This is Marketing Matters on Sirius XM’s Business Radio 111. I’m Catharine Hays. I’m the Executive Director of the Wharton Future of Advertising program here. And we’re going to shift gears a little bit to welcome our next guests. Really, the theme of the show today has been on customer-first marketing, really putting the customer at the front of your marketing and putting the individual, rather than thinking of them as a consumer. So, we spent the last hour really kind of honing in on the Hispanic market and with our last guest, talking about really seeing them from a cultural lens and how open or closed they are to cultural influences, new and old. So, that was pretty interesting. So, what we’re going to do next is shift gears a little bit, but still have this theme but talk about it more broadly with two wonderful guests. First, we have Flint McGlaughlin. He’s the CEO and Managing Director of MECLABS Institute. Welcome, Flint. Catharine: And Daniel Burstein, he’s the Senior Director of Editorial Content at MarketingSherpa and by now, sort of an old friend of mine. He was kind enough to invite me to come to a conference recently. So, we collaborated around that, didn’t quite get there, but we did do a webinar together, and he has some really interesting research. So, great to have you on the show, Daniel. Daniel Burstein: Hey, Catharine. Great to talk to you again. Catharine: Yeah. Thanks for joining us. So, before we get started, we’ll go ahead and do a little bit of background. So, Flint, why don’t we go ahead and start with you? Obviously, your organizations are interconnected, but maybe you can talk with us about MECLABS Institute first and kind of the scope of what your organization does? Catharine: That’s how those great ideas get going. Flint: I took my new wife — I’ve been married 30 years — for a walk on the beach; we were brand-new married, and I explained to her that I wanted to invest in this and begin the first internet-based laboratory that was essentially conducting behavior psychology trying to understand how people choose. My thesis was if the internet became what I thought it could be, it would allow us to watch millions of decisions occur online, and we can pattern those — build metatheory on heuristics. Here today, 20,000 experiments later, we’re still conducting aggressive research all around that single question — why do people say yes? It connects to many of the topics in your work regarding advertising and that we’re addressing today. But essentially, I have been sort of a one-trick pony. I’ve spent 30 years asking one question — why do people say yes? Given a set of options, what are the influencing factors in the cognitive psychology of that process? That’s driven all of our research and all that we do. It’s how MECLABS was born. Today, we’re still aggressively trying to achieve a 50-year plan. Catharine: That’s fantastic. Wonderful. Maybe just a little bit about your personal background too. Obviously, you’ve had some amazing clients from The New York Times, Microsoft, Reuters, etc. But you also are involved with some other interesting ventures at the Transforming Business Institute? So, we brought business together with many large agencies and have conducted research for many years working with my colleague, Dr. Peter Heslam from Cambridge and Oxford, and we’ve spent years essentially taking what we learned in MECLABS and applying it in that particular challenging scenario. Catharine: Wow. Just in the UK or around the world? Flint: All over the world. We worked with a Templeton grant, and we just finished a major project working all through Africa and analyzing where we saw prosperous enterprises in these very difficult cultures with at least 50 employees or more, and how they were using our work around the value proposition and its influence on the “yes” factor that creates a customer, and what they could learn in those cultures that would help them also thrive. Fascinating. Catharine: Interesting. Fascinating is right. We’ll have a whole other show on that one. But I love one of the quotes I saw from you or the notion that you see the enterprise as a transformative agent, and we certainly feel the same way. Flint: Yeah. I was challenging some of my friends from Oxford, and they’re great people, and there’s a huge conference there put on by Skoll and if we’re not careful, all this talk about social business, which is wonderful, these socially good businesses that are digging wells in Africa and doing other things, can imply that the only good business is a business that’s doing essentially not-for-profit work. That’s just not true. Flint: We can dream and believe in what we’re doing when we do it right. Catharine: It’s certainly a major finding of the research that we’ve done and certainly a key theme of the book “Beyond Advertising” that we published. So, we’re certainly on the same page. We feel as though this notion of the area of advertising and marketing, this intersection between corporations and people, have the opportunity to frankly go south and be pretty horrific and have a bad reputation or conversely, be really fabulous and do good stuff, not only saving the world, but just as you said, being that positive influence. Catharine: I want to come back to you. We’ll talk exactly about this topic. But before we do that, I don’t want to leave Daniel out altogether. Flint: That’s right. He’s smarter than I am, so I should shut up and let him talk. Catharine: Not at all. I do want to get into it. But Daniel, before we go any further, if you can just tell us a little bit about MarketingSherpa particularly and what you do there. Daniel: Yeah. MarketingSherpa is a wholly-owned publishing subsidiary of MECLABS Institute. So, with MarketingSherpa, what we do is we go out into the whole world of marketing, and we try to find the most inspirational stories of customer-first marketing. We publish these on marketingsherpa.com as case studies. We’re also looking for data. We collect our own data and we’re also looking for data from other companies about customer-first marketing to help marketers practice better customer-first marketing. Catharine: I know that you’ve brought together some really interesting folks at your conferences, but it’s beyond that, right? You’re also putting together case studies and that sort of thing, right? Daniel: Yeah, absolutely. Like I said, on marketingsherpa.com, we publish email marketing and B2B marketing case studies and inbound marketing to get those inspiration stories of customer-first marketing out to other marketers because, a lot of times, when we see our peers doing something, that’s what really motivates us, and we get the techniques and tactics to be able to do it ourselves. Catharine: Perfect. I do want to get into — you’ve got some fantastic research on the customer-first marketing — but before we do that (and perhaps it’s a similar topic), I wanted to get back to you, Flint. As you said, with this advent of more data than ever that we have to potentially understand what’s going on, it can also be overwhelming and potentially dehumanize. So, talk to us a little bit about what you see that trend is in terms of big data and marketing. What’s really possible in working with it? Flint: I think big data itself is a fine example. I think on two levels we have to think about it. The first one is that we talk a lot in business about big words like big data and its potential, when in truth, we’re not doing very good with our small data. So, the potential of big data is there, but both big data and, let’s say, the sort of data we had access to five years ago, has still never been leveraged in the way it could to produce real value, say, in our advertising. Catharine: How would you define the difference? What’s the difference between big data and small data as you would term it? Flint: Well, there are troves of additional information that we’re now gathering the trace. I never think of data as anything more than behavioral traces. Its true power comes from its ability for us to predict behavior. Data has some historic value, but its true value for the operating enterprise is in its ability for you to predict behavior, which means you have to do some sort of detective work tracing these customers back to their ontology, to their “who they are” piece because once you understand who they are, you can predict better what they’re going to do. I think the word “data” itself gets in the way of our thinking. Flint: This is the point that I mentioned that I’m watching. I think it’s possible for a business to individualize subscriptions at a level we’ve never seen before and serve people with a far more powerful piece of content than has happened in our history, but instead, we’re using data to create more targeted advertising campaigns and interrupt their life. It’s not the most advantageous way to leverage these behavioral traces. Catharine: Who do you see is starting to get it? Do you see any examples? You don’t have to give a particular company, but obviously, we hear it all the time, and big data analytics are a key topic. But getting beyond just the numbers to thinking of it as you said, tracing it back to actually humans and who they are and what they think, how do companies make that shift from being overwhelmed by that kind of data and really using it in humane ways? Flint: We have to translate this overwhelming feeling into an energized feeling. It’s hard to make that energy occur inside when our paradigm is wrong. Our paradigm is wrong because we constantly see this data as an enabler to treat people instrumentally instead of intrinsically. Now, when I say instrumentally, I’m a philosopher by training. Catharine: I can tell. It’s pretty wonderful. I love it. Flint: That question gets in the way of a better question, which should be this, “Who is this person, and how can I truly serve them?” If you think that way, what you call a lead becomes a human being, and you do something for them that builds trust, and that trust can be monetized in a humane way. Flint: I do. In fact, we’re building a whole taxonomy and changing even the metaphors. I think there’s more than one thing, but we often call it a new relationship. When I view it as a new relationship, that comes with a set of obligations because relationships are reciprocal. Flint: It also reminds me it’s a human being. It’s not a target. It’s not a means to an end. When you look at some of the most amazing stories in business history, often it’s happening now at a platform level. Platforms are transforming everything we understand about business. But the power of a platform is it brings humanity back into the equation because it’s people helping people, people talking to people, people interacting with people. So, ultimately, the reason platforms are so successful is because they’re bringing a new level of humanity to the way we conduct enterprise. Catharine: The peer-to-peer revolution that’s underway. Catharine: Interesting. So, instead of leads, new relationship. It’s OK if I use that? I’ll attribute it to you, Flint, I promise. Catharine: That’s wonderful. So, I guess maybe just in terms of kind of along those lines, maybe one of the things that we hear a lot about is this tension between big data and analytics on the one side and the quants and the people who are crunching the numbers and that crowd, especially here at Wharton. And on the other side, the “soft” elements of creative — and maybe less so but to some extent — design (although I think that’s in a different category altogether). But especially traditionally, “creative” when one talks about advertising and that tension between the art and the science. I think [that tension] was worse a while ago, I think there was complete distrust. But how would you see science coming into play, and how does art have a valuable role as well? How can they play well together? Flint: Well, there’s two ways to answer that question. The first is if you go back to one of the greatest books ever written on the scientific method by Thomas Kuhn. It’s an old book. It’s now a classic. Kuhn pointed out in this book that scientific revolutions occur, not because we gradually do inductive logic until we’ve proven our point, but rather because we have creative insights — we have breakthrough. Thinking that, we then go back and use the scientific method to validate or to do our best to gather evidence for. So I would, first of all, say the notion that science is all about — and I’m going to oversimplify — left brain activity is a mistake because [of] the greatest scientists. Take Einstein, he was incredibly creative, so was Newton, incredibly creative. So, first we should resist this dichotomy. Catharine: That dichotomy and putting them into different camps. Right. Flint: That’s exactly right. There is no great science without art and there is no great art, in some ways, without science. In fact, I’ll go a step forward and say both art and science do something. They shift our paradigm. They give us new ways to see the world. Take it even a step further and just make it as practical as possible in terms of a company. At MECLABS, we’re running thousands of experiments. We find that we use art to create the best hypotheses because you make jumps, intuitive leaps; you connect data in ways you might not see, and then science comes along to help us filter those creative thoughts and to help find which of these truly represent how the customer behaves in his thinking. So, we need both the scientific rigor and the artistic creative thinking to get to the best outcome. Daniel: This summer, I actually went to UC, Irvine [University of California, Irvine] because my brother and sister-in-law are scientists, they’re chemists there. I got talking to one of their peers. I tend to think of a chemist as being in a lab and those sorts of things. We figured out that a lot of what they do is writing. They do something very similar to what I do. The challenge they face with a lot of their students is they don’t have those communication skills that they need to get those discoveries across or to get what they’re learning across. I think it’s also probably on the back end, as we were talking about data before and analytics, we can discover all these things. Maybe those more scientific thinkers and organizations can discover them, but if we don’t collaborate with those good communicators, with those artists, then we can’t communicate it throughout the organization or to our customers. Catharine: To really bring those insights to life, to be able to tell a story with it so people aren’t falling asleep after charts and charts and not really getting to it. You’re so excited about the methodology that was used but not about what you’re actually going to [do to] make it actionable. I think that’s such a great point, Daniel. Those soft skills are being able to put that package together … we see at the conferences that they have where they can really tell the story that comes from those insights. I think to your point before, Flint, there’s a ton of creativity in even just asking the right questions in the first place, which is where really good outcomes come from, right? Flint: And one of the best journal articles I’ve read in many years [is] an article on the marketing of science. A team of researchers show how scientific theories must be successfully marketed. It gives many examples, really fascinating. Catharine: Yeah. There’s been a ton of discussion around that particular topic with climate change, bemoaning that we haven’t done a better job with so much scientific evidence, to be able to tell it in such a way that people accept it. There’s also some interesting discussion going on, I think, with a number of organizations with whom we’re speaking these days about the marketing of marketing. Catharine: And the role of the marketing organization. We just had an interesting roundtable meeting with the IPA, which is a professional organization out of the UK that works with planners and the agencies as well as with the ANA, the Association of National Advertisers. They’re sort of thinking the same thing. Their marketing heads, their CMOs trying to be able to tell the story of the value of marketing at the C-suite level and the business unit heads so they’re getting the investment that we need. Are you seeing that as well in terms of the folks with whom you work to get the marketing in a better place? Flint: Actually, I think that back to your vocabulary issue, marketing has a problem, and that problem is connected to the connotation of its own word. The reality is I’m not interested in marketing, but I’ve been studying it for 30 years. What I am interested in is how people think, how they choose. If I came to work every day thinking I’m going to study marketing, I wouldn’t have the energy to get up. I go to work having re-represented that concept in my mind. I think marketers, a lot of them have lost the joy in their work because it’s all about deadlines. Even when you do a good job, that lasts about two hours and a new deadline is set. The reality is if we understood the marketer is the customer philosopher of the organization. The marketer’s job is to understand the customer and to accumulate customer wisdom so they can predict behavior so that sales has a completely different experience. That changes everything. That excites me. Catharine: Yeah. I feel the same way about the Future of Advertising Program. Sometimes I cringe when I say that’s my job, but since we’re all about making it the best that it possibly could be in terms of the intersection of people and brands, then I can get excited about it and the people who are really bringing that to life. So, I can relate to that feeling. So, yeah, it does seem [like that’s] marketers, if you will, but those who are at the intersection of understanding how people react to the messages that they’re having, and being able to represent that. At the end of the day, the company is really nothing other than what sales are, and sales happen because people buy products. So, understanding why they do that, that’s where the revenue comes from. So in theory, that’s really where the service should be too. Flint: Peter Drucker said that the job of the CEO is to create a customer. What creates a company is a yes. Dan is sitting here not in the same room with me, but I know he’s an expert on this topic because we’ve worked together for more than 10 years, and he has a deep instinct for customers and for the marketplace. What we sometimes lose is really our whole job is to create a yes. Catharine: So, maybe we should … sorry, go ahead. I’ll let you finish first. Catharine: I was just going to go ahead and turn it over to Daniel to say that obviously you’ve done this tremendous work in this notion of customer theory in your writing, so maybe you can define what you mean by it. What truly is a customer theory and why should marketers care about it? Daniel: I think Flint’s done more of the work on customer theory and I’ve done more of the work on customer-first marketing. I think I’ll turn it over to Flint to have that conversation. Sometimes you can’t tell us apart, two handsome bald men. So, I understand that. Flint: Well, I can tell you this. They connect. Customer-first science is about valuing the customer, and customer-centered thinking is about putting the customer at the center of the bullseye, and it’s a very different piece. When you think about what Dan has done in that area for you to literally value the customer and deliver what needs to happen, you need to build a robust customer theory. A testing program in the average company is too focused too many times on just getting a conversion lift. But the value of an experiment in that field is in gaining a learning that can be translated into a customer insight that can aggregate toward a theory of customer. The customer theory represents the whole of your understanding about who they are so you can understand what they do. Who they are is more than a series of demographic attributes. It’s about their preferences. It’s about what they value and what they fear. It’s understanding how to articulate it to that particular type of thinker. Once you begin to build this model, then you start to create for yourself the ability to release products that instantly have force in the marketplace, to craft a value proposition that resonates, and it’s rich, and it’s quickly adopted. I think Steve Jobs was instinctively effective at this the way Jordan is effective at some things in basketball, but most of us need a method. So much of what happens here is us distilling what we’re learning in all these experiments into a method and the experimental program; we do so much testing, people think we’re in love with testing. We’re not. I’m in love with the wisdom that comes on the other side of testing. It’s customer wisdom that eventually is the treasure trove from all of this. Daniel: I think why that’s so important, Catharine, to build on what Flint was saying, is you used the analogy of climate change earlier. Climate change is a good analogy for two reasons. One, it’s extremely complex. Two, we can’t always instantly see the effects. Sometimes the effects are far off. So, when that happens and you don’t communicate about it well, people just shut down and tend not to think about it, and they see what’s in front of them. Daniel: That’s why what Flint is talking about is so important because if you don’t think about the larger approach you’re taking to your customers and you don’t think about the big picture — sometimes it’s complex, and sometimes it’s farther off affecting the customer — then you’re just focused on the here and the now and the today (and how can I burn through my list and get as many leads as possible, and there’s instant clicks and things I need through my PPC ad), as opposed to taking the bigger approach in saying, “If I’m experimenting and testing, are there some negative effects too to the way I’m hitting my short-term goals?” and looking at the big picture of how the customer sees the company and what that lifetime value is. Catharine: So, is that what you mean then by customer-first marketing? I’m addressing this to you now, Daniel. This is really the core of your research, right? It’s understanding, with the customer sort of at the core of all this, not only the positive — I think you just articulated it really well — not just the positive (in the old language “leads”), or how many new relationships am I creating, but what are the negative outcomes as well? How are people measuring the negative outcomes or are they? Are there any companies who are trying to see both the upside and downside of what they’re doing? Daniel: I think that’s the challenge we face. It’s such a big, big burden to try to measure these things. So, we talk about customer-first marketing. The reason for that word is when we look in the marketplace, there’s a lot of talk about customer centricity and customer-centric marketing. That’s good, and it’s an important approach and a good way to serve customers. However, when you look at the language of how a lot of companies and consultants and vendors and agencies were talking about it, they’re talking about targeting the customer. Kind of like Flint was saying with leads, the words we use affect the way we act. When you look at customer-centric marketing and targeting the customer, no one really wants to be targeted, right? No one wakes up today and says, “I hope I get very well-targeted.” So, customer-first marketing is not about targeting the customer. It’s about elevating the customer. It’s about not looking at what is in the short-term interest of the company. What is in the long-term interest of the customer? When possible, can you put those long-term interests of the customer first with your conversion objectives? But for the unsatisfied customers, the top thing they said is, “The company does not put my needs and wants above its own business goals.” It gets right into that customer-first mentality. I think the reason for this, I was thinking about it, is if you’re satisfied, you usually don’t question the motivations behind the other party. When one or two things go wrong, then you start to question the motivations. Daniel: I think customers look at companies the same way. When they’re satisfied, everything is going OK. Once they start to get unsatisfied, then we start looking at the motivations behind what we’re doing. That’s why those motivations are so important. We think we’re really smart, and we can trick customers or whatever, but customers can subtly perceive these things. Catharine: That’s fantastic. I want to delve in a lot more to that research, but we’re going to take a quick break now. Stay with us. We’ve got another half-hour with Flint McGlaughlin. He’s the CEO and Managing Director of MECLABS Institute, and Daniel Burstein. He’s the Senior Director of Editorial Content of MarketingSherpa, a sister organization. More to follow on some of the really interesting research that they have found in terms of how customers and people react to brands. So, stay tuned. We’ll be back in just a minute. And welcome back. This is Marketing Matters of Sirius XM’s Business Radio 111. I’m Catharine Hays. I’m the Executive Director of the Wharton Future of Advertising Program. We are talking for the rest of the program with Flint McGlaughlin, he’s the CEO and Managing Director of MECLABS Institute and Daniel Burstein, he’s the Senior Director of Editorial Content, MarketingSherpa. I will change his name to Burnstein because I seem to do that every time. Flint: I do the same thing. Catharine: So, good to have you both still with us for this last half-hour. It’s a really great conversation. Specifically, we’re talking around it, but one of the key themes is this notion of customer first. Daniel, I think for our listeners that are just joining us, I think it would be helpful to summarize what you just shared with us in terms of the really interesting research that you did for the way that people react to companies, both from a positive perspective as well as a negative perspective. Sometimes, we are only tracking the wins and number of clicks. Hopefully we’re not looking at clicks. Hopefully we’re looking at sales. But what we’re not necessarily looking at are the downsides and the negatives and how we can work on that. And for our listeners, I do encourage you, if you have questions for Flint or Daniel, please do give us a call. It’s 1-844-WHARTON. That’s 1-844-942-7866. We’d be happy to take your call and address it with obviously two amazing professionals with some really key insights. So, Daniel, I think if you can just crisp up the distinction between what you see as customer-first marketing, customer-first science and customer-centric. You sort of were making a distinction and how that comes to light in the research that you’ve done. But at the end, what is the means and the end and the goal that they’re trying to get at? They’re trying to get more from their customer, right? We have to do that in some ways to run a profitable business, a sustainable business. But in customer-first marketing, the idea is, “What can I do with my conversion objectives that will put the customer’s needs first.” Let me give you one example of this: Dan Briscoe, who I think we both know pretty well. Daniel: I know he’s been on the show before as well. He works for a company called HCSS Software. He is their Vice President of Marketing. They sell construction software to help manage very big construction projects, highways and bridges and these types of things. So, when they sat and looked at their marketing and looked at what their customers needed and they talked to their customers and listened to their industry, they found out that the No. 1 pain point from their customers was being able to hire qualified people into these construction jobs. They’re not these exciting IT-type jobs that we see, and it was hard for them to hire. Now, HCSS, they don’t have a solution for that. They don’t build a product for that. They build a software that helps manage projects. Yet still, they went all in, and they said, “Let’s try to help our customers solve this problem.” So, they created a movement called, “I Build America,” using social media, using content and using all these different things to millennials to make the case to people that you want to move and work in the construction industry. Now, again they don’t sell that product, but they saw the customer-need there. The result was they grew revenue 53% in a year, 53%. Partly because they were able to get into the right conversations with these right customers. They compete against these very, very big companies, but now all those people in the industry saw what HCSS was doing for their industry, saw how HCSS was putting them first and they were excited to work with HCSS. Daniel: In addition, he’s out in Houston, he was also able to recruit some very talented digital marketing talent. When you’re growing that fast, you need some digital marketing talent because not only did customers want to work with them because they see that they’re putting them first, but marketers want to work with them. This is an exciting idea for marketers as well. Who wants to come in and just say, “Let me target the heck out of customers and get a bunch of conversions”? Sure, you want to meet your business goals, but it’s very fulfilling to actually service the customers as well while you’re doing it. Catharine: Yeah. It is such a great example. I really appreciate your making the introduction to Dan. I know he was an award winner at one of your conferences in terms of that initiative. I think it’s so powerful, the last part of what you said. It’s interesting because it might be customer-first marketing, but at the end of the day, the impact that it has when people who are part of your organization — way beyond marketing, throughout the whole organization— get really energized about making a difference in people’s lives, the people they’re serving, their potential customers and making it something better, the motivation level goes up. So many of the chief marketing officers with whom we’ve spoken who have had these transformative campaigns where they really go back to the basics and understand what’s their purpose on earth in terms of their role in people’s lives — it’s been the ancillary benefits to the employee morale, not only employees, but everybody who’s in the service of brand. The agencies really want to work with them. I think in the case of Dan, the industry association really jumped on board and put resources behind this as well. Yeah, there’s a lot of positive externalities that seem to come to pass with the approach. Flint: You know, Catharine, it connects to something we’ve discovered in our work that I’ll point out, if it’s the right time to do so. Flint: I have, for years, heard the word value proposition bandied about. The man who coined the phrase is a man named Michael Lanning. He lives in Atlanta. We’re friends. He’s been to our lab many times. He used the phrase, but there was never any research done. Businesses adopted the word, but they didn’t actually even agree to the framework. So, one of the things we did was we began to ask the question, “Why do people say yes?” which, as I mentioned, is at the core of our research. We realized that the concept represented by the value proposition might be the right concept for us to test our way into a framework. If I am the ideal customer, why should I choose you rather than whatever the other options are? But you could put in your competitor’s names. Until a business has that answer, they really don’t have the essential driver of success. In this case, and this goes back to what Dan is saying. It’s by asking that question you can arrive at some of the conclusions that company did, that Briscoe did. I mention it because ultimately, when you’re focused on answering that question, you can move from persuasion to clarity because you clearly have the best answer and thus, clarity trumps persuasion every single day. Catharine: Clarity of purpose, that is. Flint: Well, clarity like this: Suppose that I know what particular product is actually best for my needs because they specialize in my needs. They have a powerful answer to that question. If I am that company, I don’t need to regale you with buzzwords in marketing. I need to clearly illustrate for you that I have the best solution. I need to articulate it in a way that you really understand. I don’t have to persuade you because I have the best solution. Those that have to do the most hype are those that trade on confusion because they don’t have the best answer. A company that can’t answer that question well is going to eventually atrophy because you don’t serve, and you can’t eventually serve customers well enough. Some of us are surviving on pockets of ignorance waiting to be found out. Catharine: How do you jive that with the understanding that we now have, certainly from some of the neuroscience research, but I think from behavioral economics and other sorts of things, that the reasons why people do things or what motivates people is far more emotional than it is rational and that the rational comes in afterward to kind of rationalize decisions that we’ve made for emotional reasons, cultural reasons. Flint: The answer to that is so simple and yet so complex. It comes like this. Everybody can do basic math, and we do it all day long. When I say everybody, let’s take three minus two is one and two minus three is negative one. I can get the math right of a decision. Where the emotion comes in — by the way, every day they’re doing that math. When they decide you over someone else, they are making a rational decision. Where the emotion comes in is not in doing the math, it’s in discerning the actual quantification. Is that really three and is that really two? You see, I’ll give you an example. I know a cigarette can kill me, but at the moment, I might place more value on it than it deserves. I still do the math, but I do it with different quantification. The present tense value in my mind suddenly outweighs the long-term effect to my health. So, what marketing has to understand is that yes, we can think about emotion and its importance, but it never takes away the basic cognitive calculation behind a yes. In fact, we’ve found there’s four conclusions that you have to foster in the mind. Marketing spends too much time making claims instead of fostering conclusions. Flint: Marketing, when it makes a claim, people defend against it. Great marketing doesn’t do that, it helps you draw a conclusion that you own in your mind. I’m very skeptical of the brand promise. You can promise all you want, but the brand has power when you translate that into an expectation. The real power of a brand is an expectation. If Apple made an iChicken, we’d stand in line for three blocks to get it. We expect something from it. We didn’t know we wanted iPads. Catharine: Stay tuned, you heard it here first. Flint: I’ll tell you what will be the undoing of Apple — when a few missteps later we’re not sure that expectation is going to be fulfilled, they’re in trouble. Flint: You have to get out of the checklist mentality. Let me pause for a minute. Are you asking me or Dan that question? Catharine: I was just about to say, should we give Dan a shot at this one? Flint: Sure. Go ahead, Dan. Daniel: I think one thing that’s really key and ties back to what Flint was talking about before is [the relationship between] customer theory and customer first. When we ask questions of customers in the survey, we ask how much do you feel that the company understands or responds to your needs and wants? So, really, that testing, that experimentation program, again, it’s looking at that big picture, the bigger, more complex things, so we can look and say, “Hey, how did it affect this individual conversion? How did it affect this email open? How did it affect this or that?” But if you can build those on top of each other and ask the questions in the right way and form the right hypotheses, then you build what Flint was talking about earlier — that customer theory. So, it should all be building into something bigger and that bigger thing is an intimacy of the customer and understanding of the customer. Because there exists this artificial wall, we come into work every day, 40, 60, 70 hours a week, whatever it is. We spend all of our time thinking about our products and caring about our products. You work with the people that build the products and sell the products, and you can’t help but think the products are awesome and amazing. When you look at your website, it all makes total sense because you built that website. With testing and experimentation, we can break down that wall and see what the customer is thinking. What it looks like through the customer’s eyes. You have to build it in a way that actually builds up to that bigger customer theory. Catharine: The customer theory that you talked about before — what is it that makes them say yes at the end of the day — you’re constantly testing that theory through the behavior they actually make. So, it’s behaviorally-based? Daniel: Really, that is the benefit of things like A/B testing or multivariate testing … focus groups and surveys and these sorts of things can be valuable. It’s good to get customer preference. It’s good to get customer opinion, but tying back to what you talked about, sometimes we make decisions based on emotion and then backfill them with logic. So, customers will tell you what they think all day long. What it really comes down to is OK, what are they actually spending the money on, and what decision are they making? The awesome thing about the internet today is it’s become easier to be able to access that information. I remember in my early days as a copywriter, I had the chance to work on these Wall Street Journal print ads that we were running for one of the clients. The other team that was writing it, the ads weren’t pulling. They wanted to be able to run the ads at least three times and keep getting them to pull leads they were pulling. I wrote one, and it worked well. But the funny thing is the span of time it took; it was about six months before we learned that this one ad worked better than this other ad. Daniel: Today, what you can do online is amazing. But now, the challenge of that is because almost anyone can do it, almost anyone can do it poorly. That’s why it’s also important to take an experimental approach to understand what validity threats you face when you’re running experiments and to run it in a way where you’re truly learning something about the customer, and you’re not just seeing something that’s random chance, or you’re not creating some other validity threat with what you’re saying. Catharine: And also too, that you’re not becoming a slave to the short-term as well, so you’re really looking at long-term effects, which we know from a lot of our research, one of the dangers of digital marketing is the feedback loop is so fast that you might not be getting a true long-term view of the real effectiveness of what you have going. So, having that long-term perspective is really critical in making sure you do it. Do you have any suggestions for ensuring more measurement and accountability to the customer in an organization using experimentation? Because I think companies are interested in experimentation. I think they’re willing to do it, but in making it really customer oriented, what are some techniques that you’ve found or ways that people are doing it more? Flint: Should I answer that? Catharine: Yeah. I should be more explicit. Catharine: It’s like a jump ball. Flint: After Dan answered, I was thinking I’m so glad I didn’t talk because it was an elegant answer. Catharine: It was quite an elegant answer. Daniel: The challenge is you’re not necessarily your customer. A few years ago, you’d go to marketing events all the time before mobile marketing became really hot. There would be some mobile marketing consultants. They’d say, “OK. Who out there has a smartphone?” Everyone would raise their hands. They’d say, “See, everyone has smartphones. You’ve got to get on a smartphone and use our services,” or whatever. Really, what we learned was all marketers have a smartphone. What if your customer isn’t a marketer? So, we did a case study with Mary Abrahamson. She’s an email marketer at a company called Ferguson Enterprises. They sell like plumbing supplies and HVAC supplies to plumbers and HVAC people and all these sorts of things. She had a smartphone. She used it every day. She learned they hadn’t made that transition yet. They were still on feature phones. So, by thinking like the customer, she was able to do a campaign based on text messaging that was much more effective than using apps and these smartphone things that wouldn’t really matter to her customers. I think Flint should get into some of the methodology because I think that really helps you transition and look better as a customer through experimentation. Catharine: That’s a great example. Yeah, Flint? Flint: Dan’s answer is excellent, though. What I’ve found is that the marketer every day goes to work with a blind spot. The blind spot is the most dangerous phenomenon that we experience. That blind spot is rooted in human nature and particularly in own self-interest. No matter how hard we try, we often are blinded by our own self-interest. So, what we’ve had to do here is develop heuristics that allow us to think systematically. You’ll see us talk sometimes about the conversion index and series of elements that allow you to look at a piece of collateral and consider the clarity of the value proposition. Is there friction being generated? Is there anxiety being generated? The first thing I would say is you need a toolset that helps you get out of yourself and into the skin of the person you’re trying to reach. Catharine: Who speaks the loudest, right? Flint: Yeah. Or this is even worse — everybody’s so nice that we reduce to the lowest common denominator, and we have this piece of compromise that represents our collateral. Catharine: There’s some interesting research around brainstorming and some of the challenge around that, right? It’s not always the best technique for coming up with the greatest ideas. The social dynamics come into play and might not necessarily bring the best idea to the fore. Interesting. Flint: In the best companies, those we see that are really transforming the world, they lead with a science dynamic. That doesn’t eliminate the people aspect, but it enhances it. The science dynamic applies a method, and it’s built on a metatheory, and it takes the best ideas of people, and it disciplines them to a testing process that brings the customer to that table. Jeff Bezos used to leave in every meeting for years a chair with nobody in it sitting at the table to remind everybody there that the customer is in the meeting today. I applaud the idea. You need to take the idea beyond the reminder and into tools and techniques that help you systematically bring the customer into the conversation. In a practical way, if you were planning some piece of collateral right now and you don’t know which headline is best going to produce the two jobs of the headline, which is to capture attention and convert it to interest, that’s all headlines should do, then the room can generate eight ideas. But let’s let the customers tell us which one they like. That can be done with a test. Daniel: Can I end with an embarrassing story, Flint? Flint: End with mine. I’ve got a long string of them. Daniel: Catharine, to build on what you’re saying about brainstorming, this is a few years ago. We have MarketingExperiments web clinics where we have these webinars and share a lot of our research. We have meetings beforehand where we bandy about different titles of what we think would be a good idea. I have a writer on my team named Paul Cheney. He had been here four weeks, six weeks. He’s really young, fresh out of college. We’re bandying about different ideas, and Flint had his idea, and Paul came up with one. Flint’s like, “Why don’t we just test it?” So, we tested the two ideas. Flint: Catharine, what was funny is his exact words were, he had the numbers and he said, “Significant,” almost millennial language. So, I put the two up there. I showed what happened, and then I invited to refund everybody’s price to the summit. Catharine: Yeah. But come on. The experimentation won out. You had to do it. That is really a fabulous story. Thank you both so much. So, I’m afraid with that, we’re just about out of time. I wanted to thank both of you for coming on the show today and sharing some of your philosophy. It’s really interesting to get a philosophy person, Flint, to really be able to bring our thinking to the next level. Daniel, it’s always wonderful to hear from you. Your anecdotes and your way to bring marketing to life and your passion for customer-first marketing and the practicalities of it are really fantastic. So, thank you both so much for joining us. Daniel: Thanks for having us, Catharine. Flint: Thank you for your excellent book, by the way. Catharine: Our pleasure. Thanks for the plug. If listeners want to keep up with Flint, you can go to MECLABS.com or follow him on Twitter @FlintNotes or @MECLABS, and if you want to keep up with Daniel, check out marketingsherpa.com or follow him on Twitter @DanielBurstein or @MarketingSherpa. They have a lot of interesting information and as I said, a lot of interesting case studies. Thank you to all our case studies for joining and sharing your knowledge with our listeners, Linda Lane Gonzalez of AHAA, David Wellisch of Collage Group, as I said, Flint McGlaughlin of MECLABS, Daniel Burstein of MarketingSherpa. I want to thank our audio engineer, Tatianna Zamas, our producer, Michelle Stucker, our amazing assistant at the Wharton Future of Advertising Program, Shannon Cantrell. Thanks to the new friends that I’ve made at the AHAA Conference, pretty wonderful to be tuning into that really powerful aspect of cultural change that’s happening and power that’s in our society now. Thank you for tuning in. Thanks to everyone who listens to the Marketing Matters radio show. If you want to find out about us, just go to Wharton Future of Advertising, you’ll find out lots of great information. Thanks. 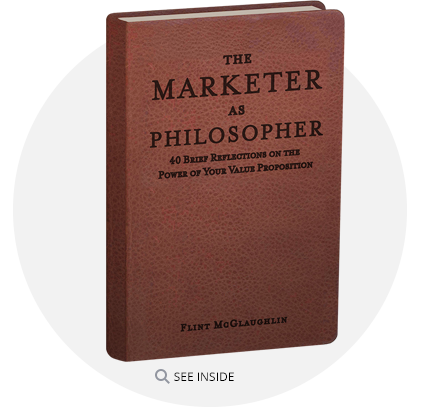 Author Flint McGlaughlin, Managing Director, MECLABS Institute, expounds on the deeply intellectual role of the marketer in his book, The Marketer as Philosopher. 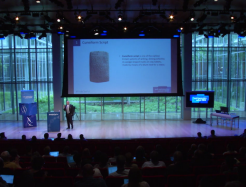 Watch this session replay from Web Optimization Summit 2014 to learn what is really powering sustainable competitive advantages for companies in today's markets.